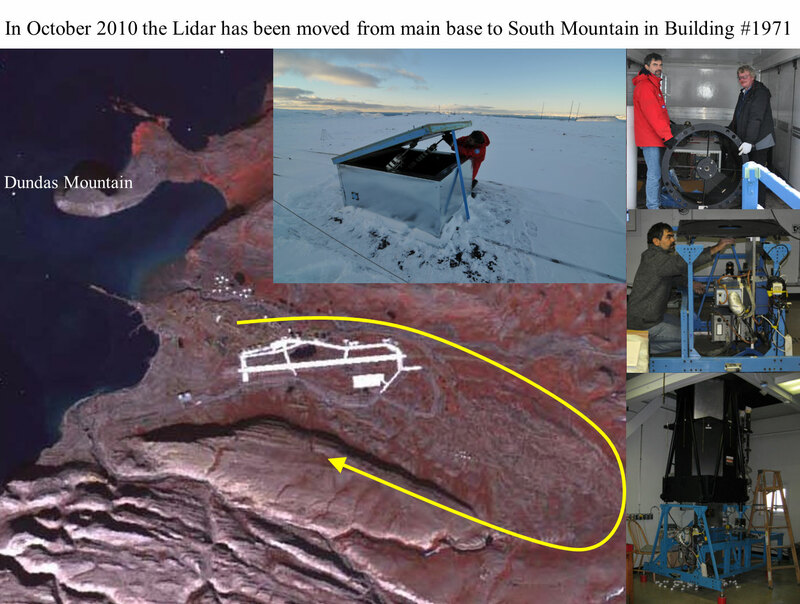 The Lidar was installed at Thule Air Base in 1990 for the observation of the upper tropospheric and lower stratospheric aerosols, and the measurement of the middle atmospheric temperature (T) profiles. The lidar has been operational during many of the last twenty years, particularly during the winter season. 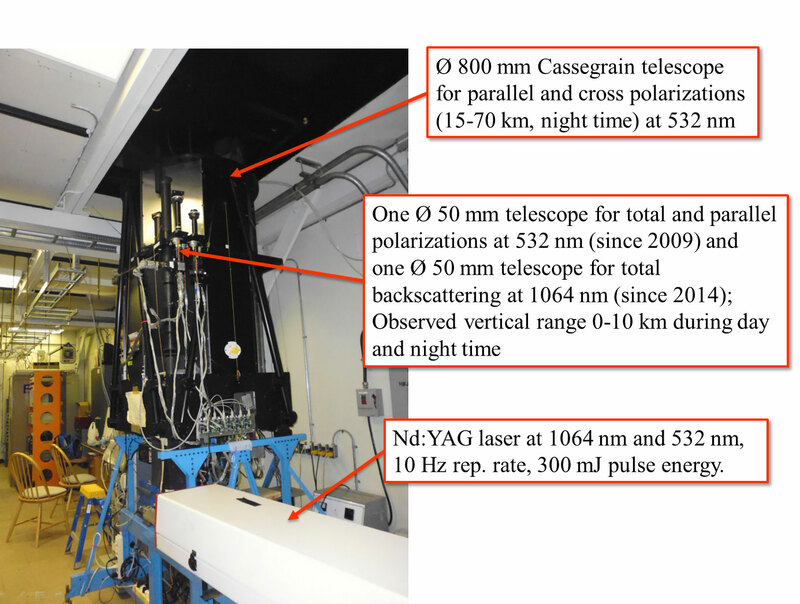 The lidar emitting source is a linearly polarized Nd:YAG laser at 1064 nm and 532 nm, with a repetition rate of 10 Hz. a 800 mm diameter Cassegrain telescope, with two digital channels at crossed polarizations for the detection of the signal from the upper troposphere, stratosphere and mesosphere. The 80 cm telescope is equipped with a rotating shutter to prevent detectors’ saturation from the low-altitude signals. two 50 mm diameter refractive telescopes for the measurements of backscattered signals from the lower troposphere in two polarizations and at two wavelengths (1064 and 532 nm). 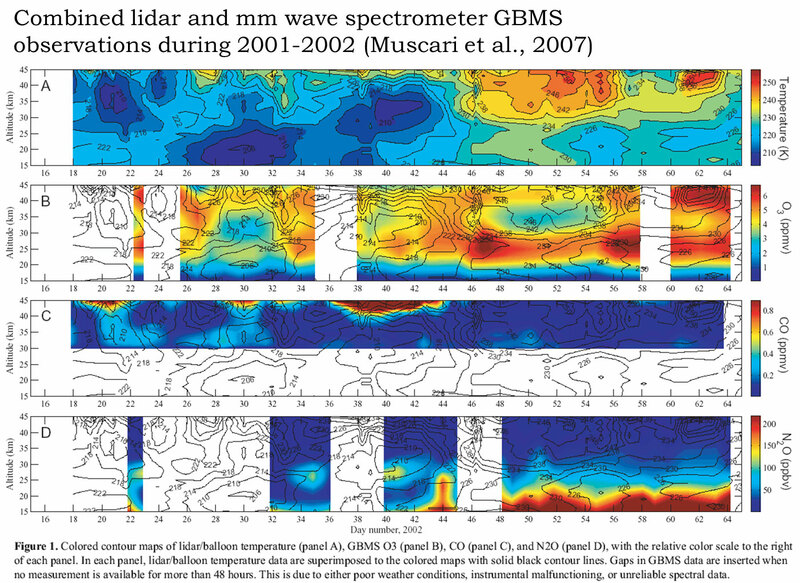 Example of Temperature profiles obtained by lidar on 3 different days (1994-2006-2012) at Thule. T, T+σ, and T-σ are shown in black lines. 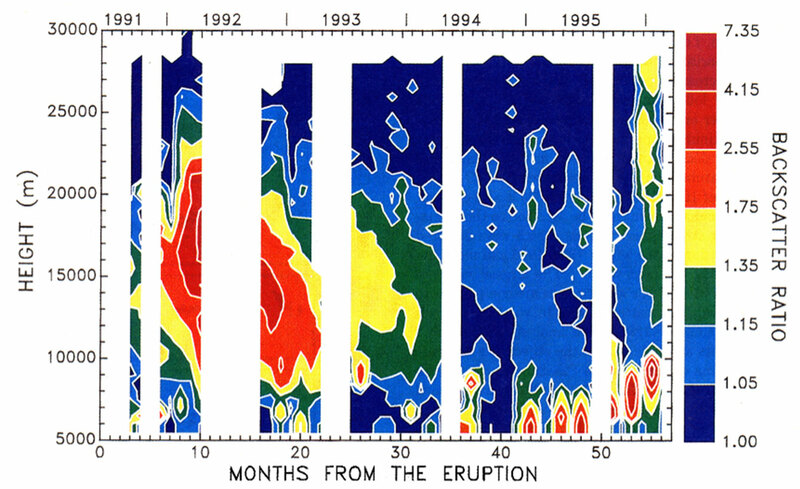 The blue dashed line represents the temperature CIRA 1986 model for the specific month. Red dotted profile is closest in time radiosonde data available from Eureka or Alert. Backscatter ratio versus height obtained at Thule in the period September 1991 to February 1996. The lidar has permitted to show the build up and the decay of the volcanic aerosols originated from the eruption of Mount Pinatubo in June 1991 [di Sarra et al., 1998].